Cemeteries give me chills. No, not because I think they are creepy or I fear a zombie attack. But chills, because they are such a tangible link to our ancestors. Imagine placing flowers at the grave of your fourth great-grandmother. You may be reenacting a scene that occurred at the exact same spot two hundred years ago as your fourth great-grandfather mourned his deceased wife. He gazed on that very same stone. Yes, chills! I realize that graveyards are not everyone's cup of tea, but they are essential to genealogists in helping us to establish relationships and dates, and they can even give us insights into the personalities of our ancestors. While these days a person might die in New York, but be buried far away in California, before the days of trains, automobiles, and airplanes, and improved embalming methods, you can bet that most people were buried near where they died. A good place to start is to determine where and when a person died. This can be learned through death certificates, obituaries, funeral home records, Bible records and many other sources. If you do find a record, many of these will give the location of interment. However, the place of burial is not always provided and for many there may be no record at all. Once you've determined the likely place of burial, it's time to set out to see if you can locate your ancestor in cemetery transcriptions or records that have been published. Though we should never assume that the Internet holds all the answers when it comes to genealogy, it's not a bad place to start. Volunteers have posted millions of cemetery transcriptions on-line at websites such as Interment (www.interment.net) and Find-A-Grave (www.findagrave.com). Most county websites that are part of USGenWeb (www.usgenweb.com) include at least some transcriptions. For some of these, even photos of the grave markers can be found. Some larger cemeteries have their own websites and you can search their cemeteries on-line and print out maps showing burial locations. Burial information on veterans and their spouses who have been interred in national cemeteries can be found on the National Gravesite Locator (gravelocator.cem.va.gov). While much is published on-line nowadays, in addition, thousands of books have been published containing cemetery transcriptions. You are most likely to find these in libraries near where your ancestors lived, but you can also find books covering widely scattered areas of the country at libraries with large genealogical collections. The quality of these transcriptions varies greatly. The best of these transcriptions will be indexed, and the transcriptions will be listed in the order they were viewed in the cemetery. This can be very helpful as naturally folks were often buried near other family members. But if the transcriptions are given in alphabetical order, the important clue of who was buried near whom is lost. I have yet to see a cemetery where the deceased were buried in alphabetical order. If you're lucky, plat maps and lot numbers will be included. Yet, as with all transcriptions, they are subject to error and, if possible, you will want to visit the cemetery yourself. That's more rewarding anyway. It is important to remember that not all of your ancestors will have existing grave markers. In the early years of settlement in America, graves may have just been marked with uncut stones. Sometimes markers were made of wood or soft stone which have not withstood the elements over the centuries. Many folks never had markers at all. Maybe their family always meant to put up a stone for them but couldn't afford it or never got around to it. My own grandfather died in 1944 at a young age. My grandmother could not afford an expensive marker and had one made out of slate. By the time my grandmother passed away fifty years later, my grandfather's marker had nearly disintegrated and was barely readable, so my parents had a new granite marker made for both of them. As mentioned above, sometimes cemetery transcriptions will include location information which will enable you to find a marker quickly, telling the lot and section number. Country or church cemeteries may be small enough that you will be able to scour the cemetery yourself going row by row and locate your ancestor with little trouble. Of course, some larger city cemeteries could take months to search by that method. Before visiting the cemetery, you'll want to contact the cemetery's superintendant's or sexton's office by phone, letter, or email. They should be able to let you know exactly where your ancestor is buried. Try to get as much information from the office as possible, as their burial records often contain information such as the date of burial, cause of death, the name of the owner of the plot, and lots of other goodies. While you're at it, be sure to ask them the days and times that the cemetery is open for visitors, as you don't want to travel a long distance only to find the cemetery closed. We all know that most grave markers will include the name of the person and usually a year or date of death. Often a year or date of birth or an age is also given. Those are fairly straightforward. However, beware! Just because something is written in stone doesn't mean that it's correct. Grave markers should always be considered secondary sources. While they might be absolutely correct, they might not. If only I had a nickel for every time my name has been misspelled, even on important certificates or documents where you would think people would be careful. If a mistake was made on a grave marker, it might have been too expensive to fix it. I have seen this. Likewise, I've seen many markers with dates that have been shown by further research to be incorrect. These "facts" are only as reliable as the knowledge of the informant and the informant may only be going from memory on when the deceased was born - an event that may have happened 80 to 90 years ago, long before the informant was born. Usually the death date will be correct, but remember that grave markers weren't always erected when the person died. 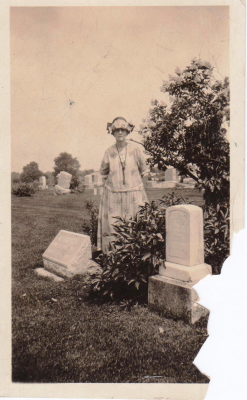 Flora (Murphy) Davis connecting with her ancestors at the IOOF Cemetery, Darlington, Indiana, 1920s. As the in case of my grandparents, the permanent marker might not have been purchased until decades later when the remaining spouse died. By then memories might have been fuzzy. Also, just because a person has a marker in a certain cemetery does not necessarily mean that the person was buried there. Soldiers might have two grave markers, one where they are actually buried near where they died, and another in a family plot in their hometown cemetery. My second great-grandfather, George W. Noel, was a Union soldier in the Civil War, and he has a grave marker in the family plot in Redfield, Iowa, which gives a death date of 4 July 1863. However, George was taken prisoner in Mississippi, and by all known accounts, no one knew when or where he died. Often there is more to the story than can be engraved on a stone. Always try to corroborate with other sources. In addition to names and dates, further inscriptions and artwork can tell us about the person, or at least about the family members that ordered the marker. Quotes from the Bible or poetry might tell of a person's faith or even their sense of humor. Symbols such as Bibles, doves, gates of heaven can show beliefs. Affiliations with fraternal organizations, branches of the military, or unions may be shown in acronyms, initials, or symbols. An extensive collection of symbols can be found on the Grave Addiction website (www.graveaddiction.com/symbol.html). Isaac Likins at Wiscotta Cemetery, Iowa. Let's look at an example of an information-packed grave stone. 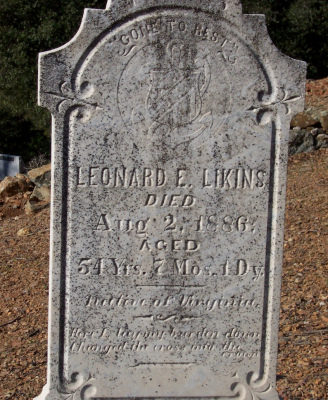 My second great-grandfather's brother, Leonard Extine Likins, is buried in the Oak Knoll Cemetery near Amador, California. The marker provides his death date, "Aug. 2, 1886," as well as his age, "54 Yrs 7 Mos 1 Dy." 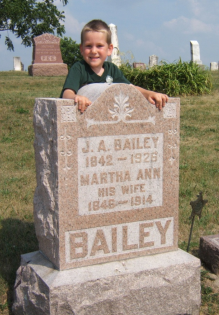 Using a website like Ancestor Search's Tombstone Birthday Calculator (http://www.searchforancestors.com/utility/birthday.html) we can figure that his birth date would be 1 January 1832. That doesn't match the birth date I have for him in other records, so more research is needed. "Native of Virginia" is an important fact to follow up on. "Gone to rest" and the quote "Here I lay my burden down, Changed the cross into the crown," both tell something of the faith of the family. The symbol at the top tells even more. It is a shield with an anchor and the initials "AOUW." A little research reveals that this is an emblem for the Ancient Order of United Workmen, a fraternal organization that formed after the Civil War. This is particularly interesting as at this time the AOUW paid a death benefit of at least $500 to the family of a member upon his death. From newspaper accounts I know that Leonard was murdered while working as a night watchman at a local mine. Certainly his family appreciated that benefit following this unexpected tragedy. You'll want to bring your camera when you go to the cemetery to record the markers. However, always bring along a pencil and paper as well so you can record inscriptions that are difficult to read or that might not show up in a photograph. You don't want to get home and discover that you can't read the inscription you traveled so far to see. You might also want to bring along some gardening tools in case vegetation around a marker is obscuring the stone. Be careful to never damage the markers. On softer stones, any attempt to remove lichen or moss can irreparably damage the stone. Much has been written about safe and effective ways make rubbings or casts of headstones. For a complete explanation, see Sharon Carmack's Your Guide to Cemetery Research listed below. Next to libraries and courthouse attics, cemeteries are favorite destinations for many genealogists. And while it's hard to compare to the experience of standing on the same spot where your ancestors mourned, today through websites like Find-A-Grave, you can virtually visit graveyards you might be unable to travel to otherwise. I hope you also get chills as you dig into the clues your ancestors left for you at the cemetery. Carmack, Sharon DeBartolo. Your Guide to Cemetery Research. Cincinnati: Betterway Books, 2002. Greenwood, Val D. The Researcher's Guide to American Genealogy, 3rd edition. Baltimore: Genealogical Publishing Company, 2000.